This collection comes with 100 models of chairs, beds, tables, couches and armchairs. This collection comes with 100 models of modern gadgets, like clocks, vases or candlesticks. This collection comes with 100 models of lamps. This collection comes with 100 models of doors and windows. This collection comes with 43 models of armchairs. This collection comes with 100 models of basins, bath, toilets, showers and much more of bathroom stuff. This collection comes with 70 models of computers, hi-fi stereo, printers, TV and much more of newest technological stuff. sofas, couches, armchairs, desks, stools. This collection comes with 100 models of beds with sheest, mattress, quilts, pillows, from cradles to sophisticated love beds. This collection comes with 100 models of street lamps, benches or telephone boxes. This collection comes with 100 models of modern SPA where you can find bathtubs, showers, jacuzzi, saunas etc. This collection comes with 100 models of modern furniture where you can find chairs, tables, sofas, armchairs etc. 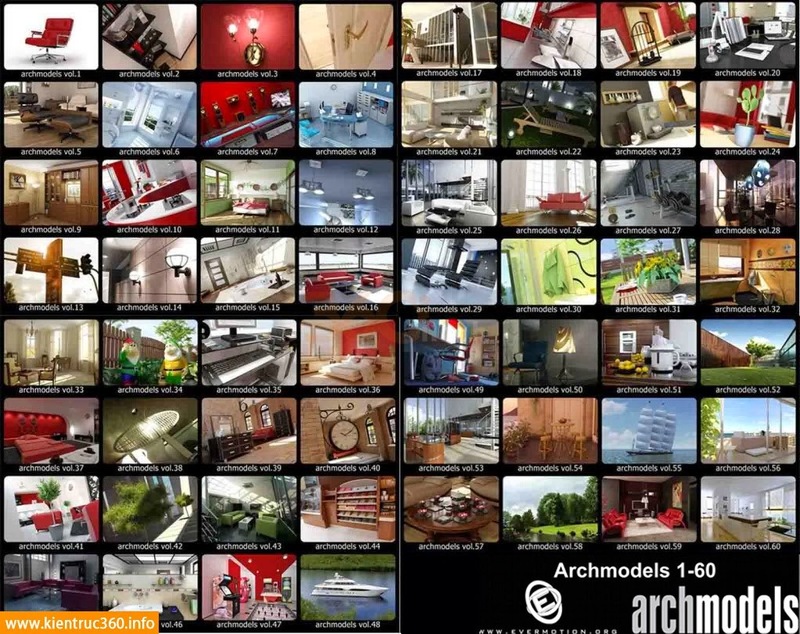 This collection comes with 30 models of cg houses. This collection comes with 100 models of kitchen stuff. This collection comes with 100 models of home gadgets. This collection comes with 100 models of office gadgets. This collection comes with 100 models of modern furniture. Archmodels vol. 22This collection comes with 100 models of grills, benches, chairs or lawnmowers. Archmodels vol. 23This collection comes with 100 models of AGD models. Archmodels vol. 24This collection comes with 60 models of flowers and plants. Archmodels vol. 25This collection comes with 100 models of house furniture. Archmodels vol. 26This collection comes with 100 models of house furniture. Archmodels vol. 27This collection comes with 100 models of gym and fitness accessories. Archmodels vol. 28This collection comes with 100 models of interior lamps. Archmodels vol. 29The CD comes with more than 100 professional, highly detailed objects of amazing furnitures. Archmodels vol. 30The DVD comes with almost 80 professional, highly detailed objects of cloths, from towels to t-shirts. Archmodels vol. 31Archmodels vol. 31 comes with almost 65 professional, highly detailed objects of very realistic garden plants. Archmodels vol. 32 comes with almost 99 professional, highly detailed objects of African decorations. Archmodels vol. 33Archmodels vol. 33 comes with almost 80 professional, highly detailed objects of old classic furniture. Archmodels vol. 34The CD comes with 50 professional, highly detailed objects of sculptures. Archmodels vol. 35Archmodels vol. 35 comes with almost 100 professional, highly detailed objects of hardware and Hi-Fi systems. Archmodels vol. 36High detailed models of beds, pillows, quilts, mattress, sheets with all textures, shaders and materials. Archmodels vol. 37Archmodels vol. 37 comes with almost 100 professional, highly detailed objects of beds. Archmodels vol. 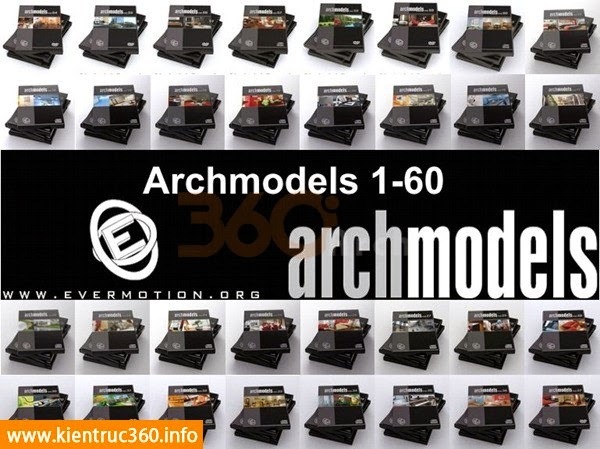 38Archmodels vol. 38 comes with more than 130 professional, highly detailed objects of lamps. Archmodels vol. 39Archmodels vol. 39 comes with more than 115 professional, highly detailed objects of furnitures. put on the tables or furniture. Archmodels vol. 41This collection comes with 65 new objects of realistic plants. Archmodels vol. 42This collection comes with 65 models of realistic plants. Archmodels vol. 43This collection comes with 115 models of modern furniture. drinks, frozen food, meat, fruits, cakes, clothes, trousers, shoes, newspapers, books, jewelry etc. armchairs, desks, chairs, sofas, coffee tables. This collection comes with 70 models of bathroom equipment. tennis tables, chess, roulette games, golf, , , gadgets etc. briefcase, wallets, gloves,hats, heels, sunglasses. This collection comes with 33 models of yachts, boats, motorboats, vessels, sailings, kayaks, pontoons, water, scooters. This collection comes with 77 models of kitchen accessory where you can find pots, coffee, wine, books, beer, plates, kettles, cuttings, boards, bowls, salts, peppers, ice, cream, candles, knives. This collection comes with 60 models of trees, leaves and bushes. This collection comes with 70 models of office furniture. where you can find tables, shelfs, wardrobes, chest, drawers, desks. This collection comes with 120 models of restaurant furniture where you can find chairs and tables. Archmodels Vol. 55 comes with 38 models of street vehicles and ships. This collection comes with 65 models of bathroom furnitures where you can find sinks, towels, soaps, mirrors, trashes, hair dryer, combs, wardrobes, bathes, showers, bidets, toilet papers etc. The Archmodels vol. 58 collection comes with 58 models of very realistic plants. This collection comes with 116 models and 25 sets of modern furnitures where you can find armchairs, sofas, tables, pillows.